A portrait by Choney Pelzang, former Madanjeet Singh Group Scholarship at Beaconhouse National University (BNU), School of Visual Arts, Lahore. 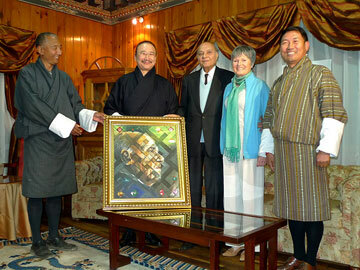 It was presented by Voluntary Artists' Studio, Thimphu (VAST) in presence of Agriculture Minister Lyonpo (Dr) Pema Gyamtsho, SAF Founder, Goodwill Ambassador Madanjeet Singh and the SAF Bhutan Chapter Chairman, Sangay Ngedup, in Thimphu. The portrait depicted SAF Founder's vision to unite South Asia through education.